The climbingtrip of me and my boyfriend Marco to Canada had the precise destination Helmcken Falls. This is an enormous cave of 150 meters height with a waterfall in front, that continuosly sprays water perls on the rock of the cave and so creates fascinating structures and big icicles. 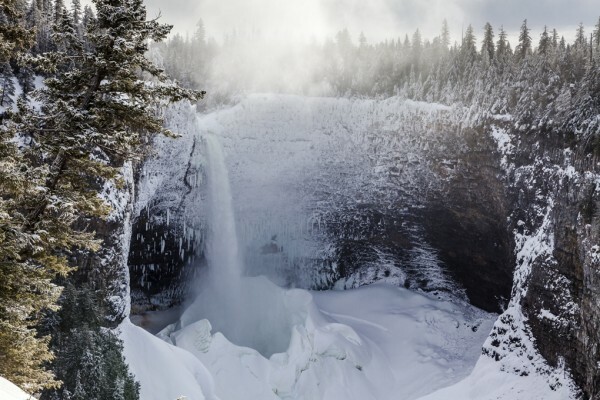 Helmcken Falls is situated in the Rockymountains, a 6 hours drive from Vancouver and since I saw years ago pictures of the first routes there, this place was on my adventure list. In fact this trip turned out to be my biggest adventure I did. Already the approach to the cave, descending a very steep forest and with two rapell downs, one of these along a 20 meter waterfall, are not the usal. When you then turn a rockpillar you stand just in front of the cave and with tons of icicles hanging above you. This area can become quite dangerous as the ice can suddenly break, especially when the temperatures go up around 0°C. The existing routes are not easy to find as the bolts are mostly covered with ice and before you can climb them you have to clean the bolts and also break the biggest icicles on your line. This can be very hard depending on the conditions in the cave and in the case of “Wolverine”, the route I wanted to try initially, it turned out to be too dangerous. The route “Clash of the titans” was bolted and climbed last week by Tim Emmett and Klemen Preml, two of the best climbers in this discipline. The two of them togheter with Will Gadd had discovered this place and opened all existing routes. They incouraged me to try theyr new route and after two days I could climb the route they had graded WI10+. The climbing on this overhanging ice is something special and for me it was the hardest ice I had ever tried. 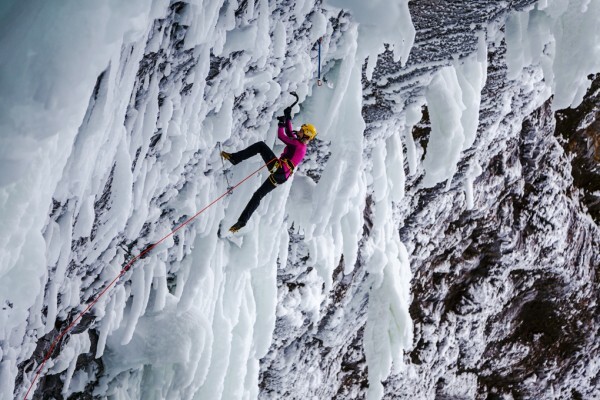 In the beginning it felt to me as the icicles must brake when putting weight on them but after a first recognition I got more confidential to this crazy climbing. This adventure for me is unforgettable and I would like to thank so much Tim and Klemen for theyr motivation and Marco and Klaus for theyr company and the great pictures.